Choosing a cabinet color is such a big decision, sometimes we over think it and just can’t decide. Breath… It will be okay. Remember everything is repaintable. 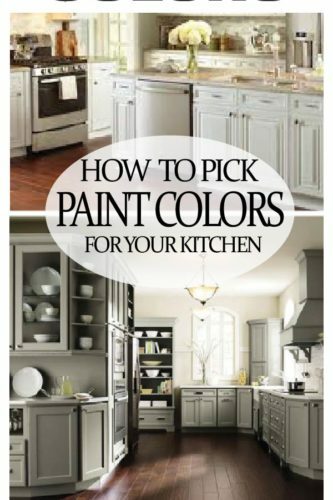 When trying to decide on a color to paint your kitchen cabinets, keep in mind that your color choice is a little different than painting a piece of furniture. Bold and vibrant furniture can add a pop of joy in one corner of your room, and eye-catching home decor aspect. Your kitchen cabinets take up a lot of walls and floor space. They are the dominant feature in your kitchen. For this reason, you will want to stick with neutrals. If you really want a flare of color, have an accent wall with a bright color. Repainting a wall, later on, is much easier than repainting an entire set of cabinets. Pops of color in kitchen home decor can bring in your favorite colors too. Also, if for any reason you decide to move, and if the color is not appealing to potential home buyers in the future, you will have the monumental task on your hands of repainting your cabinets – yet again. 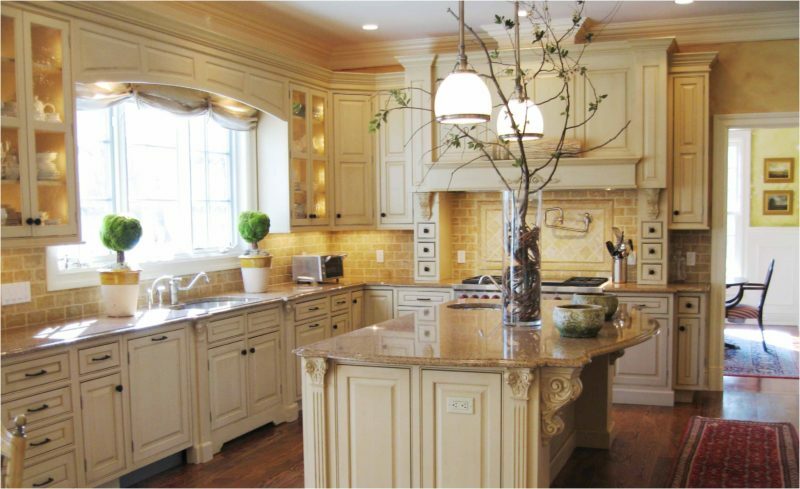 White is always a perfect color for kitchen cabinets. You can either go straight white, off-white or cream. 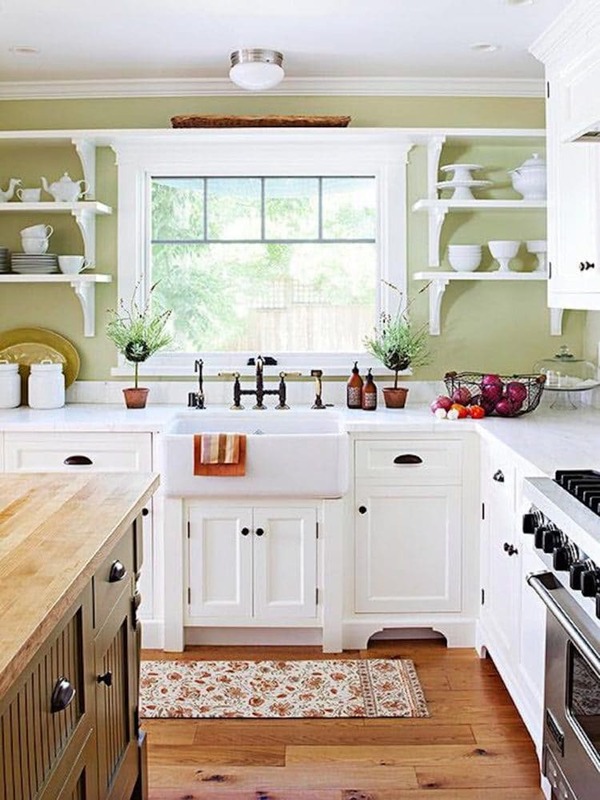 White cabinets brighten a kitchen and make space feel much more open and light. I also wouldn’t go too off white or too yellowish white. White give a great backdrop for vibrant colors. Yellow, orange and bright green look amazing with white. 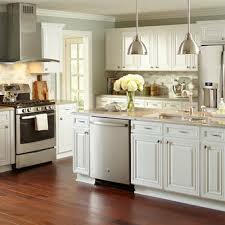 White cabinets must be water based, as oil based white paint will yellow over time. White will show marks however. If you are naturally a clean person and can keep up on the scuffs and crayon marks, go for it. If cleaning is not your strength, I would pick something else. Antiquing and Aging – Antiqued neutral colors, at least for the time being are in and as long as the paint job is clean and done well and the color choices are mild and neutral shades, aging or antiquing the cabinets, shouldn’t be a hindrance for resale. Do keep in mind that although antique white is huge, in 10 years it may not be. Do it if you love it, not just because it is trendy right now. Light gray is so in right now and I love it! Gray is classic and elegant. 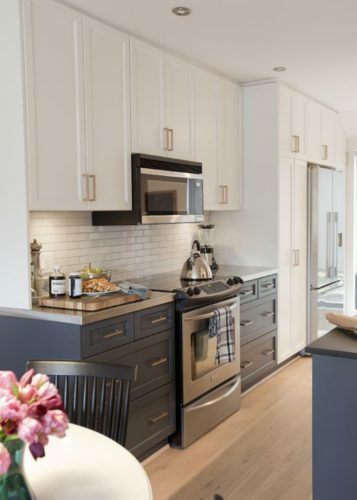 Why are gray kitchen so popular? 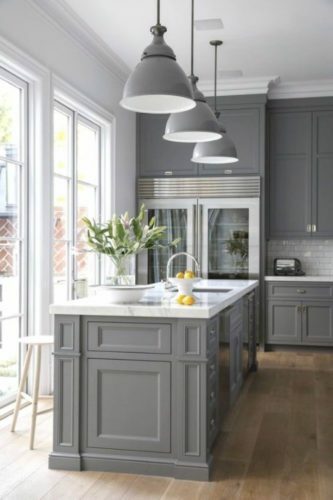 Gray allows the other lements of your kitchen to stand out. 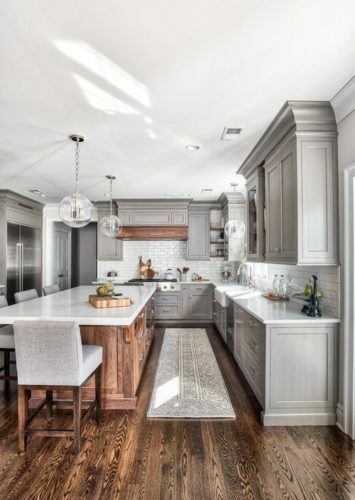 The eye sees the cabinets as a strong backdrops to a beautiful crisp counter top, a beautiful backsplash mosaic or a deep brown hardwood floor. Gray is also a very relaxing color according to psychology experts. It relaxes and sooths a view but also excites them at the same time, with the possibility of what else is in the room. Many colors go with gray such as green, blue, purple, pink, and even neutrals like browns and cream. Gray tends to not show dings, and scuffs as much as white, so it is more conservative in lasting a long time. Remember when choosing your gray, that there are many shades. Some give off warmth and others make it chilly. Check out my article on more details on how to pick your perfect gray here. On the opposite of white and gray is black. Black cabinets can be beautiful for kitchens. You do have to have certain elements, to not over power the room and feel like you are in a cave. Your kitchen must have a lot of natural light coming in, like this kitchen. You also must have a lot of white to off balance the dark. White walls, white countertops or a white tile floor will help. 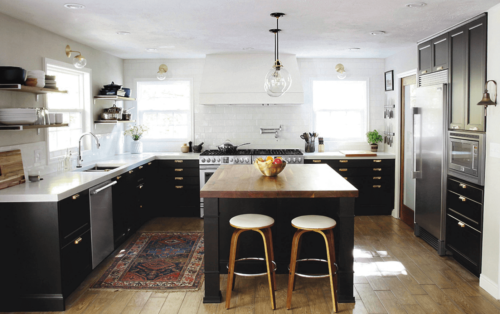 Both silver and gold are beautiful accents with black, and give a luxurious feel to this kitchen. Light olive or sage, ultra light blue and pale yellow have all turned out beautiful in kitchens. 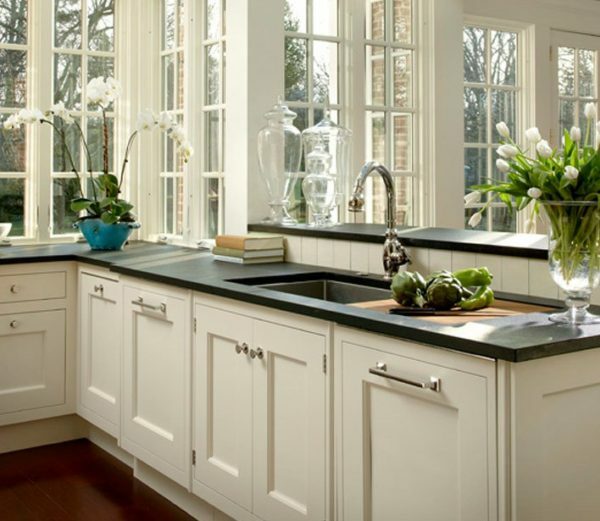 If your kitchen is open and large, lean towards a soft light color. Dark colors such as red or navy look good in smaller kitchens, that have ample light sources. This blue is Benjamin Moore- van courtland blue color. I love how it adds color without becoming distracting to the rest of the home. 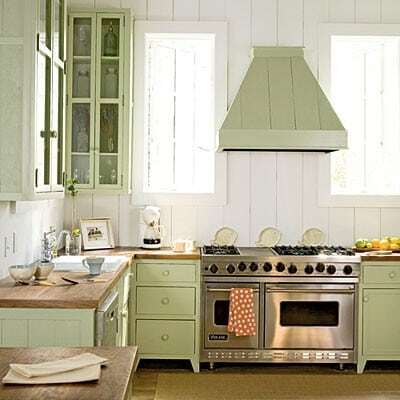 This green kitchen is a beautiful example that your color does not need to be the main color of the kitchen. 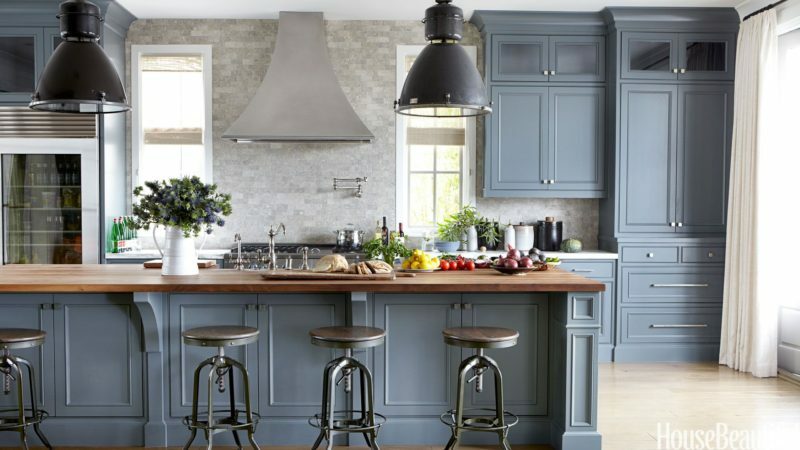 This kitchen color is from Europe, so I don’t have the exact color name, but I am sure you can find a similar tone at your local paint store. Remember you don’t have to limit yourself to one color. 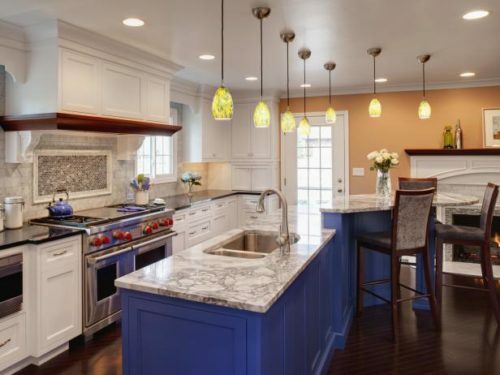 This kitchen used Navy and White for a very elegant nautical feel. Make sure the darker color is always on the bottom, and the light on top. This give an airy open feel to the ceiling and walls, making the room feel larger. The color of your kitchen is your personal taste. My friend who loves bright colors. She painted her kitchen chairs teal and orange- and she loves them! On the other hand, gray kitchens like the one above make me feel relaxed and enjoy being in the kitchen. Choose what makes you comfortable! If you still don’t know what color to pick, take a short online color personality test to see what colors you are most comfortable in. Do one better and take a quick look in your closet. What colors do you find beautiful? I did this and my closet was full of gray! So my new kitchen, will be gray. The most important thing, besides color, is to make sure that your paint job is done well and that the cabinets look clean and polished. Even if you choose to distress or antique the cabinets, I would do minimal distressing and minimal dark wax. You don’t want to give the impression that the cabinets are dirty, especially if they are newly painted. 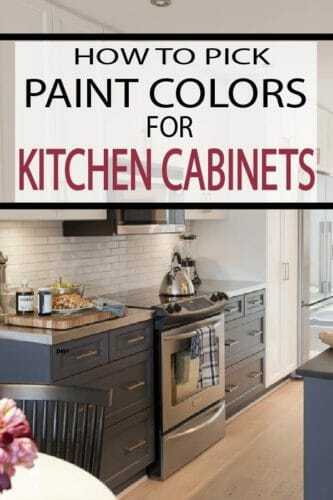 Here are other tips on painting: Mistakes People Make When Painting Kitchen Cabinets. Love these ideas? Pin this article for the future!